Supportworks manufactures a variety of helical foundation systems that are used to solve pipeline support issues in various applications. Our helical anchor products offer high capacity solutions at an extremely competitive cost. Helical piles and anchors are an excellent solution that can overcome a variety of terrain challenges, including buoyancy control, span rectification and storm current protection. 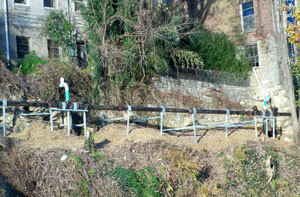 No matter how demanding your terrain issues are, you can rest assured that your pipeline is secure and stable. Using our hydraulically installed helical screw piles, your pipeline will remain level and capable of transporting maximum capacity no matter what the ground conditions are. No longer will you have to worry about stress loads causing your pipeline to sag or sway because of shifting terrain, or the effects of external elements such as flood currents or rising and falling ground. 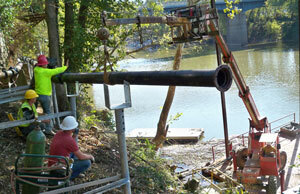 Helical piles install quickly and can be load tested to ensure they will carry the necessary loads. Supportworks has worked for some of the largest companies in the world. Our screw piles and anchor systems are safe, reliable and secure in all environments. Don’t trust a system that is inadequate and outdated. Let innovation provide you with stabilization. Supportworks helical pipeline supports cost less and are able to provide higher capacities than traditional systems of concrete coating or concrete weights. Because we use materials that are cost effective and install quickly, our systems can save thousands of dollars over more traditional pipeline support systems. Supportworks pipeline support systems give you the ability to achieve affordability, deliverability, and proven performance. Contact Yellowstone Structural Systems to design a solution for your pipeline stability project today.